Why not celebrate Memorial Day weekend in Chicago with a party experience like no other? After all, it’s the long weekend and you have an extra day off and you deserve to celebrate it right. Set sail with us on our Chicago Memorial Day weekend cruise aboard the Spirit of Chicago yacht! This Sunday night cruise is going to have you partying on Lake Michigan, as you get ready to enjoy your Monday off. 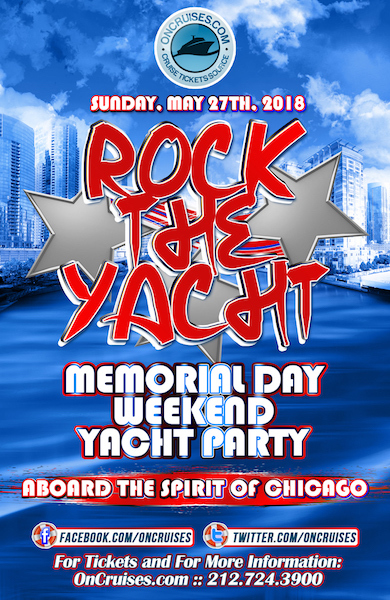 Party on the seas with us over the weekend and make your Chicago Memorial Day weekend one to remember! The Spirit of Chicago yacht is going to sail you around the Windy City and treat you to amazing views as you celebrate. This Chicago Memorial Day weekend cruise will have you viewing Chicago from either the inside of the yacht or the outside observation decks. The Spirit of Chicago yacht has three climate-controlled decks with panoramic windows for you to take in the views. Make your way to the outside of the yacht and enjoy a better view of the city as you party to the sounds of our live DJ on board. Party over your Chicago Memorial Day weekend with your friends to your favorite Top 40, Pop, Hip-Hop, and Dance hits! Dance your way into Monday to your favorite songs and celebrate your Chicago Memorial Day weekend on the dance floor. While you move your body throughout the Spirit of Chicago, make sure you keep the drinks pouring. This Memorial Day weekend cruise will have fully stocked cash bars on board keeping your cup full all night long. Order up all of your favorites and sip them down while you make your Chicago Memorial Day weekend one to remember! Celebrate the long weekend with us and enjoy your Monday off to recover from our unforgettable cruise. Book your tickets today and celebrate with us aboard the amazing Spirit of Chicago yacht!